The ScatterPointSeries are represented on the chart as not connected data points presented by an arbitrary Template. 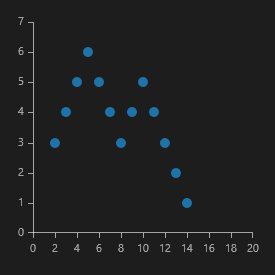 Each scatter data point has X and Y values which make the position of the data point in the data source and its location on the plot area unrelated. For example the third data point in the data source may appear before the first data point when plotted. There are also scatter line and scatter area series which behave in the exact same way with the only (visual) difference that the points define a line and area respectively. ScatterPointSeries class inherits from the CartesianSeries class - See the inherited properties. XValueBinding: Gets or sets the binding that will be used to fill the XValue of ScatterDataPoint members of the DataPoints collection. YValueBinding: Gets or sets the binding that will be used to fill the YValue of ScatterDataPoint members of the DataPoints collection. Here's an example of how to implement a RadCartesianChart with the ScatterPoint Series. Then, create the sample data. Finally, create a chart using XAML.